This gentleman had been dissatisfied with his teeth for many years. 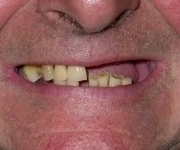 He had a very strong bite and had lost a number of crowns and teeth leaving gaps. He had been unable to tolerate dentures. At examination many teeth had broken off at gum level, were worn or had abscesses. Some of the lower teeth were however healthy. The lower canine (eye-teeth) and one of the lower molar teeth were considered healthy enough to be retained and were used to carry a conventional lower bridge. 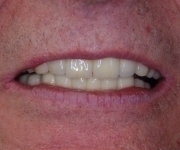 The upper jaw required clearance of the diseased teeth and eight implants were placed in the upper jaw to allow full arch implant restoration with fixed porcelain bridges.